I don’t want to jinx it, but more and more of those exciting US brands seem to making the leap across the pond – we’ve got Kat Von D now, Buxom, Glossier is coming and now It Cosmetics has fully launched, exclusively to Selfridges. It’s an exciting time for my face, but not for my purse. Luckily I managed to nab some It Cosmetics pieces when I was in New York back in October so I’ve had plenty of time to try some pieces out and share the details on what you need to try first. The blogger favourite! 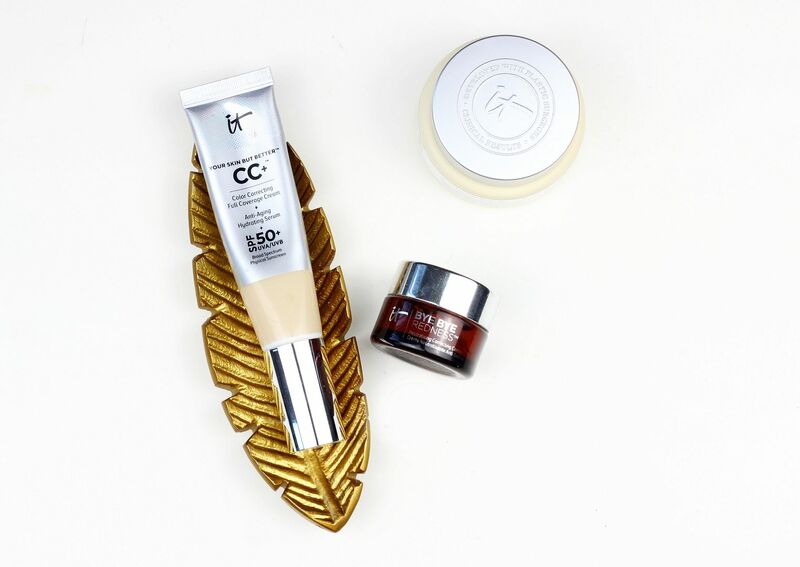 This CC cream is the perfect mix between a tinted moisturiser and a regular foundation because it has the coverage and skin-perfecting capabilities but it also has the bonus of skin-loving ingredients and a dewy finish. I’m the shade Fair, which I find a good match for my skin and it seems to come in a decent range. The formula is designed to make your skin feel naturally flawless, and the SPF 50 ensures skin is protected. All in all, it’s a lovely light base for daytime that I find myself reaching for a lot and would recommend for a suits-all base. A makeup artist in Sephora told me I needed this, and she was right. One of my biggest hang-ups is that my cheeks are permanently red and flushed so I always colour-correct before foundation – I’ve been through about 19 tubes of the Mac yellow corrector so it’s sort of my thing. This tiny little pot is sort of like the Kevyn Aucoin sensual skin enhancer but with a far more spreadable texture so it doesn’t drag across the skin. The coverage is insane, and anyone who has redness in their skin needs to try this! The beige tones really do neutralise any redness and leave the complexion looking more unified. Have you tried anything from It Cosmetics?